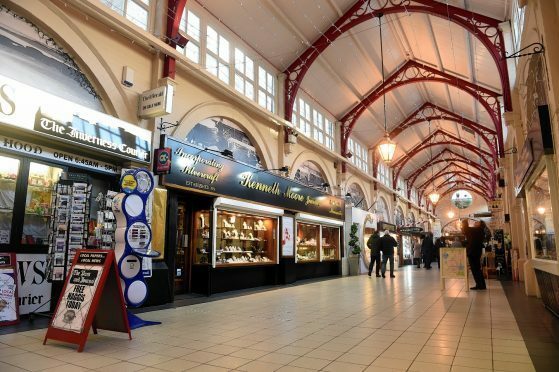 The roof of Inverness’s Victorian Market is leaking again – renewing concerns about the so-called “private” section of the city centre shopping arcade. The current issue affects the Queensgate entrance, which was added a number of years ago to close it off against birds and to better preserve the structure as a whole from the elements. But now rainwater from the roof and downpipes is coming through, leading to a section of the walkway being cordoned off and around a dozen buckets and containers being placed just inside the entrance. Now local shopkeepers are growing more concerned that the remedial works that they conduct in their own time and with their own money will not be sufficient if the situation gets worse. One local businessman, who did not want to be named, makes an effort to check the roof every three months despite working a 70 hour week – he was planning to check again on Monday. He said that the likely problem is the downpipe being unable to handle the volume of rainwater or else that it has become blocked leading to pools gathering on the roof. The manager of Corr Gorm charity shop Ania Couston said the leaks have already caused her to limit what products are on show outside the shop out of fear they could get suffer water damage. She said: “It is a shame that this part of the market looks the way it looks and it is not very appealing to customers or the tourists. “And especially with bad weather, the rain or heavy snowfall, it will be leaking so people coming in here, in the market for shelter, to have a nice shopping experience they just get soaked.